This week's Science Nation video, “Helping nanotechnology work for everyone,” is about the Center for Nanotechnology in Society at Arizona State University. The video covers a selection of CNS's efforts, research, and collaborations, including the Futurescape City Tours, the Phoenix 2050 Design Studio, Nano Around the World card game and the Life Cycle Assessment for Responsible Innovation research and workshop, all aimed at incorporating responsible innovation practices into the development and deployment of nanotechnology and other emerging technologies. 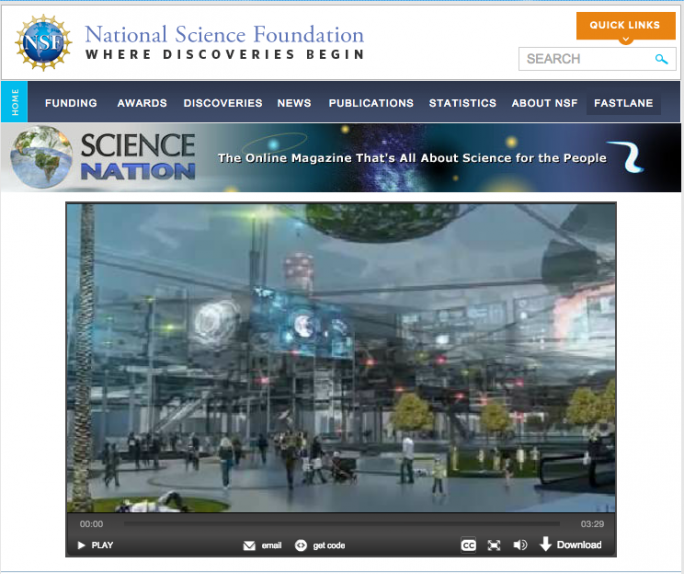 “Science Nation” is a video series commissioned by the NSF Office of Legislative and Public Affairs. The series is distributed throughout the world, including to LiveScience.com and other media outlets on the Internet, local community TV stations in the U.S. via TelVue Connect Media Exchange, Voice of America for international broadcast distribution, the NSF STEM video portal Science360, the Knowledge Network video stream and Roku channel, and K-12 content distributors in the U.S. and abroad. Some episodes also appear in the nationally-distributed PBS documentary seriesThis American Land.